Seventeenth century? Dutch or English? The work of one hand or two? Our Art Detectives displayed zeal and stamina on their way to solving the question of who painted The Forge of Vulcan, in a discussion which involved a number of international art experts and took more than a year to conclude. The discussion to date, locate and attribute the painting took in such subjects as helmets, heraldry, anvils (should we consult a blacksmith? ), drapery, courtesans, and flabby arms and legs. The Forge of Vulcan is in the collection of Abingdon Town Council, and it was they who approached Art Detective asking to know more about the work. The painting was used on the Art Detective homepage when the site launched in March 2014. It is a striking image, the subject taken from Roman mythology. 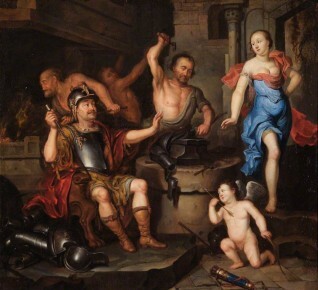 Vulcan (the god of fire and the forge) is shown as a blacksmith. He is fashioning armour for Mars who, whilst he sits and waits, receives an admiring glance from Venus, Vulcan’s wife. Mars and Venus were lovers, and the figure of Cupid (the god of desire) can be seen in the foreground. The very first comment in the discussion suggested the painting is seventeenth century and Dutch. Whilst the English artist Henry Gibbs was considered as a possible candidate, this was discounted by Karen Hearn, author of an article on the artist. Several Art Detectives mentioned contacting the RKD Netherlands Institute for Art History for an authoritative opinion, with The Barber Institute of Fine Arts putting forward the name Ary de Vois (1632/1635–1680). De Vois was a Dutch painter who was born and died in Leiden. Did the Art Detectives agree that the painting was of the quality one might expect from this artist? Puzzling to many contributors was the uneven execution of the work, Richard Green (Art Detective Group Leader – Yorkshire and the Humber: Artists and Subjects) noting ‘[the] composition is inventive, confident and even compelling...There is a degree of accomplishment in the execution of the faces (particularly that of Mars) and the armour, which is totally lacking in the painting of certain of the exposed limbs.’ Was this the result of more than one hand at work? Tim Llewellyn (Art Detective Group Leader – Continental European before 1800) felt that this inconsistency was likely to be an artist used to working on a smaller scale being unable to ‘sustain the quality of his or her figure drawing and painting on this scale’. De Vois, other Art Detectives noted later in the discussion, was known for his small cabinet pictures. With two specialists suggesting de Vois, Richard Green started contacting more experts. He first mentioned Dr Alois Lipka, whose research concerning the artist is kept by the RKD. It transpired that Dr Lipka had not been in contact with the institution for a number of years and Green, somewhat ominously, presumed he was ‘no longer active’. In correspondence with Ellis Dullaart (Assistant Curator Dutch and Flemish Old Master Painting, Collections & Research at the RKD), it seemed that she and her colleagues did not agree with the attribution, but curators at the National Museum, Warsaw (which houses an autograph work by Ary de Vois) had no doubt that the work was painted by him. Other Art Detectives remained unsure, feeling the painting was not of the quality of the artist’s other works. Stalemate? And then...four months after he had been presumed ‘no longer active’...Dr Alois Lipka posted his contribution to the discussion. Having studied the de Vois’ work for 30 years, he did believe that The Forge of Vulcan was by him. Then a word from the Group Leader, Tim Lewellyn, to bring the year-long discussion right up to date: he encouraged Art Detectives who were not convinced to consider a signed work by Ary de Vois, lot 442 in Sotheby's, London, sale of Old Master and British Paintings on 27th October 2015. This painting is now listed as being attributed to Ary de Vois (1632/1635–1680). This amend will appear on the new version of the Your Paintings website in February 2016. Thank you to everyone who contributed to this fantastic discussion. Do you know who painted 'The Forge of Vulcan'?